As we celebrate the 241st anniversary of the independence of the United States from Great Britain, a glorious birth of freedom for the world to copy, the Constitutional protection afforded by the First Amendment of a free press has never been, in modern times, under such assault. And it has enormous implications for the ability of democracy itself to continue. However entertaining and emotionally satisfying the humiliation of, and attacks on a free press have been for supporters of President Trump, there is a much greater issue at stake then they perhaps realize. All Americans need to be mindful of the connection between a nation having a free press and support for free speech in the health of our democracy; free government itself hanging in the balance. When the Chief Magistrate of a country attacks our Constitution in this manner everyone should feel the chill. Chief Magistrate was an interchangeable term for the president of the United States on the part of our Founding Fathers. Trump is our nation’s chief executive, charged under the Constitution with seeing that the laws of the land are faithfully executed. When Donald Trump as president personally attacks journalists, even to the point of video GIF’s showing him beating them up, when he suggests to supporters at rallies to yell hate filled epithets at journalists, and when he foregoes customary contacts with the press, he is failing to fully execute the laws of the United States. No president likes the press. Not one. For it is a free press that holds everything a president says or does up to public scrutiny. The press makes it more difficult to achieve what a president wants to do, and at the same time can be a message system of his warmest and good impulses. Not directly and intentionally on the part of our media, but indirectly when a president does or says something that might embarrass him later, or supporting a piece of legislation or conducting a foreign policy that many Americans would oppose if they knew. Worst of all, what is reported in the press, is often the fodder for the other party and their electoral apparatus to criticize, and in so doing, make re-election more difficult. What’s different with this president is that he, in contrast to a Jefferson, has said to the nation that the press or media are the enemy of the people. This falsehood and contra-constitutional thing is the statement of a tyrant, not the defender of liberty and justice for all. Modern tyrants have actively sought to discredit a free press, the most notable Hitler in the Germany of the 1930’s. Trump is not Hitler, at least not yet. But those who love our liberty, the nation our Founders put together, and our Constitution, the most successful and admired such document on the planet, ought to be concerned—very concerned. It is Donald Trump who is now issuing such an invitation. He may be doing this at least in part due to a surprisingly fragile ego. But when such attacks on the press are made by the President of the United States, possessor of immense power, the implications and force of that fact are of dire effect for the future of a free society. Donald Trump’s main idea set out for Americans on this 4th of July just last night was that He, and all Americans would prevent the media from acting to stop him. He included all of us, but that rhetorical trick, hides his cupidity. “The state media is trying to prevent us” he said. He also snarkily said that he was president and the media is not. The press is NOT an institution controlled by the government of the United States, or any state government or any local government. The freedom of the press is the freedom from state control. He lies here too. He is one third of the Federal government in his own person. The Constitution limits his power, yet he seems to fail to grasp that the office of president has limited powers, however powerful the ones granted him are. Our system of government provides for checks and balances on the power of any of the three branches of government. Trump is not our ruler. He serves us for four years and is accountable to us for the maintenance of our Constitution as a sacred trust. That includes a free press that helps the people hold him accountable. Republicans should while supporting their President, yet insist he behaves himself and that he acts in accord with our Constitution. The Media does not determine our Constitution but is a part of it within the First Amendment. It helps give voice to vox populi. It is a means to an end so that we as citizens may know what our President is doing, and why he is doing it. We cannot evaluate a Barack Obama or a Donald Trump without a free and vigorous press or media doing its job freely, so that we too may exercise free thought and expression, to really be free people. Trump’s behavior and actions so far have been more dictatorial than democratic (small d). John Adams said that “The liberty of the press is essential to the security of the state.” He meant that the security of a free government, held in common by a free people, could not be maintained without a free press. Support your free press and media. Yes, complain about news stories that offend you and offer your take on things. But never give in to a person who thinks they ought to be a ruler and not one who governs us in a limited free government. That’s the value of what we celebrate now. 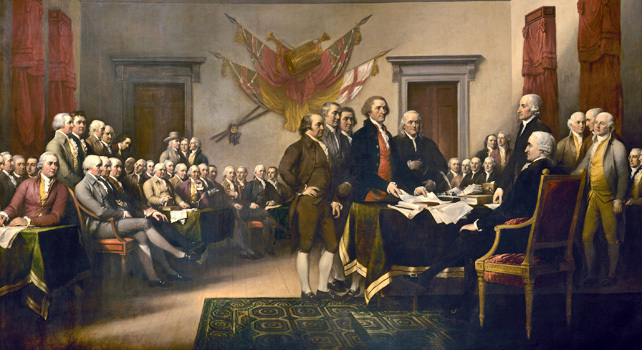 Hoorah for the United States, our Constitution, and our free people of all political stripes on this Independence Day! This entry was posted in Community and Citizen Action, Essays, It's About Struggles for Justice, National Affairs and tagged 4th Of July, a free people, democracy, Donald J. Trump, First Amendment, free expression, free government, freedom of information, Freedom of the Press, PRess Freedom, Trump and a Free Press. Bookmark the permalink.